Jammu & Kashmir is the only States in northwest India with a considerable share of the Scheduled Tribes in its population. They form 11.9 percent of the total population in 2011. The share of STs in the contiguous State of Himachal Pradesh is much lower at 5.71 percent, and there are no Scheduled Tribes notified in the other neighbouring States of Punjab, Haryana, Chandigarh and Delhi. Of 14.9 lakh STs counted in J&K in 2011, 13.2 lakh are Muslim, 1.0 lakh are Buddhist and about 67 thousand Hindu. During the last decade, Muslim STs have grown by about 38 percent and Hindu STs by 41 percent, but the number of Buddhist STs has contracted by 1.6 percent. The share of Buddhists in the total ST population has consequently declined from 9.3 to 6.8 percent, while that of the Muslims has increased from 86.3 to 88.4 percent and of Hindus from 4.3 to 4.5 percent. This absolute as well as relative decline of the Buddhist STs is one of the more striking aspects of the religion data of Census 2011. 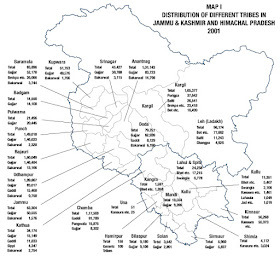 A large majority of the STs of J&K are Gujjars. Of the total 14.9 lakh STs in 2011, 9.8 lakh are Gujjars and another 1.1 lakh are from the related tribe of Bakarwals. These two tribal communities are almost entirely Muslim and they are found in all parts of J&K except in Leh (Ladakh). During the last decade, the population of the two tribes together has grown by nearly 33 percent. Bot or Boto comprise the main Buddhist tribe of J&K. They are almost entirely in Ladakh, nearly 80 percent of them in Leh (Ladakh) district alone. During the last decade, while the Gujjar-Bakarwals have grown by 33 percent, the population of the Bots has declined by more than 5 percent. Remarkably, the few Muslims among the Bots have grown at about the same rate as the Gujjars. There is also the small Buddhist tribe of the Changpa in Leh; their number has declined by 47 percent, from 5 to 2.7 thousand. Again, the number of few Muslims among the Changpas has more than doubled. Besides the Bot or Boto and the Changpa, there are the Muslim tribes of Balti and Purigpa in Ladakh, the latter mainly in Kargil. The Baltis have grown by nearly 34 percent. The growth of the Purigpas has been much slower at less than 4 percent. There are about 50 thousand persons of the Dardic tribes of Brokpa, Drokpa, Dard and Shin in Kargil and Baramula districts. These tribes are now almost entirely Muslim, but they retain strong memory of their Hindu antiquity in their language and culture. During the last decade, the population of these tribes has declined by about 7 percent. Finally, there are the mainly Hindu tribes of Gaddis and Sippis. The two together have a population about 52 thousand, of which more than 95 percent are Hindus. They are in the southern districts of Udhampur, Kathua and Doda, the latter two adjoin Chamba of Himachal Pradesh, which has a larger number of Gaddis. Gaddis number about 46.5 thousand; during 2001-11, their population has grown by about 30 percent. The population of Sippis, who add up to just about 6 thousand, has declined by 9 percent. There are nearly no Muslims among the Sippis; but about four hundred Muslims among the Gaddis in 2001 have multiplied six times to reach about 2.5 thousand. Thus, the main Muslims tribes of Gujjar, Bakarwal and Balti have grown much faster than others and the growth of Muslims has been remarkably high even among the non-Muslim tribes. The Buddhist tribes of Bot or Boto and Changpa have declined in numbers. The Hindu tribes of Gaddi and Sippi have retained their share in the population largely unchanged. In Himachal Pradesh also, the growth of Buddhist STs has been much slower than others. During the last decade, the population of Hindu STs has grown by 65 percent and that of Muslim STs by more than 200 percent, while Buddhist STs have grown by less than 2 percent. Consequently, the share of Muslims in the total ST population has risen from 5 to 9.5 percent and that of Buddhists has declined from 18.4 to 11.7 percent. Of 3.92 lakh STs counted in HP in 2011, 1.78 lakh are Gaddis and more than 99 percent of them are Hindu. Nearly all of the Gaddis are in Chamba district. During the last decade, the number of Gaddis has nearly doubled. Gujjars are the second largest tribe of Himachal Pradesh. About 39 percent of 92.5 thousand Gujjars counted in 2011 are Muslim. In Himachal Pradesh, Muslim STs are found only among Gujjars. During 2001-11, the number of Hindu Gujjars has multiplied by 2.4 times and that of Muslim Gujjars has tripled from 12 to 36 thousand. The share of Muslims among the Gujjars has consequently increased from 34 to 39 percent. Besides the Gaddis and Gujjars, there are smaller tribes that are limited specific regions of the State. There are Kanauras or Kinnaras of Kinnaur district; Bhots or Bodhs, who are akin to the Bots or Botos of Ladakh and inhabit Lahul & Spiti and Kullu districts; Pangwalas of the Pangi valley in Chamba; Swanglas of the Pattan valley in Lahul & Spiti; and, Lahaulas of the Lahaul valley. Of these, Bhots are largely Buddhist, Pangwala and Swangla are largely Hindu, and Kanauras and Lahaulas are partly Hindu and partly Buddhist. During 2001-11, Kanauras, who are the largest of these tribes, have declined by about 17 percent and Lahaulas, who are the smallest, have grown by about 66 percent. Bhots, Pangwalas and Swanglas have all grown by about 7 to 8 percent. The most remarkable change in the demography of the Scheduled Tribes in Himachal Pradesh is the disproportionately high growth of Gujjars and particularly of Muslims among them. In both Jammu & Kashmir and Himachal Pradesh, the Muslim and Hindu tribes seem to have flourished, while Buddhist tribes have contracted. Jammu and Kashmir is the only State in northwest India to have a considerable share of the Scheduled Tribes in its population. In 2011, nearly 15 lakh STs have been counted in the State in its total population of 1.25 crores. The STs thus form 11.9 percent of the population. The share of STs in the contiguous State of Himachal Pradesh is much lower at 5.71 percent, and there are no Scheduled Tribes notified in the other neighbouring States of Punjab, Haryana, Chandigarh and Delhi. The Scheduled Tribe population of Jammu and Kashmir is even more predominantly Muslim than the total population of that State. Of 14.93 lakh STs counted in 2011, 13.20 lakh are Muslim. They have a share of 88.4 percent in the ST population; the share of Muslims in the total population is 68.3 percent. As seen in the Table above, the share of Muslims in the STs is rising; during 2001-11, it has increased from 86.3 to 88.4 percent. There are about one lakh Buddhists among the Scheduled Tribes of the State. But while the share of Muslims in the total population has increased by more than 2 percentage points during the last decade, that of Buddhists has declined from 9.3 to 6.8 percent. In fact, the absolute number of Buddhist STs has shrunk by about 1,500 persons. As we have seen in an earlier note, the growth rate of Buddhists during 2001-11 has been lower than other major communities in India as a whole. But the absolute decline in their numbers observed in Jammu and Kashmir is among the more striking aspects of the religion data of Census 2011. There are only 67 thousand Hindus among nearly 15 lakh STs of Jammu and Kashmir. But unlike the Buddhists, and also unlike the Hindus in the total population of the State, the share of Hindus in the ST population has improved marginally from 4.32 to 4.51 percent during the last decade. Besides the Muslims, Buddhists and Hindus, there are only a few other STs. Their total number in 2001 was 1,209, of whom 508 were Sikhs and 258 Christian. That number has now increased to 4,704, of whom 1,775 are Christian and 665 Sikhs. The number of Christian STs has thus multiplied by nearly 7 times, but it still remains fairly small. Surprisingly, 1,170 of the STs have been counted under ORPs; there were only 6 STs counted in this category in 2001. The Census of 2011 lists 12 Scheduled Tribes in the State in addition to the residual category of the Generic or Unclassified Tribes. In Map-I below, we have compiled the population of the relatively more numerous tribes of each district as counted in 2001; similar data for 2011 has not been published yet. Many of the tribes of Jammu & Kashmir are also present in considerable numbers in the neighbouring State of Himachal Pradesh. To show this spread of several tribes across the two States, we have included the data for Himachal Pradesh in this Map. We shall discuss the religious demography of the Scheduled Tribes of Himachal Pradesh in a later section. Gujjars and Bakarwals are closely related tribes. Traditionally, both are nomadic pastoralist communities; the former are cow-keepers, the latter goatherds and shepherds. The two share similar social structure, have the same family (gotra) names and marry among each other. Gujjars are the largest tribe of Jammu and Kashmir. Of 14.93 lakh Scheduled Tribes counted in 2011, 9.81 lakh are Gujjars. Bakarwals are far fewer; only 1.13 lakh of them have been counted in 2011. 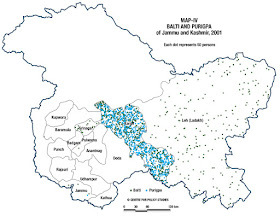 As seen in Map-II below, Gujjars have a considerable presence in all districts of Jammu and Kashmir, excepting Kargil and Leh of Ladakh, and also in Chamba and some other districts of Himachal Pradesh. Bakarwals also have a presence in all districts of the State; there are a few Bakarwals in Kargil also, though there are none in Leh. There are no Bakarwals in Himachal Pradesh. Of 9.80 lakh Gujjars counted in 2011, 9.74 lakh are Muslim and of 1.13 lakh Bakarwals, 1.12 lakh are Muslim. There are only 4.4 thousand Hindus among the Gujjars and 1.4 thousand among the Bakarwals. As we shall see later, nearly 40 percent of the Gujjars in Himachal Pradesh and almost all of them in the adjoining district of Chamba are also Muslim. During the last decade, the population of Bakarwals has increased by 86.4 percent. Gujjars have, on the other hand, grown by 28.4 percent. Part of the extraordinary growth of Bakarwals may probably be because the names Gujjar and Bakarwal are to some extent interchangeable. But, the total population of the Gujjars and Bakarwals together has also grown by nearly 33 percent. This is much higher than the average growth of 23.6 percent of the total population of the State. It is largely because of the high growth of Gujjars and Bakarwals, who constitute 73 percent of the total Scheduled Tribes of the State, that the ST population has recorded a high growth of nearly 35 percent during the last decade. 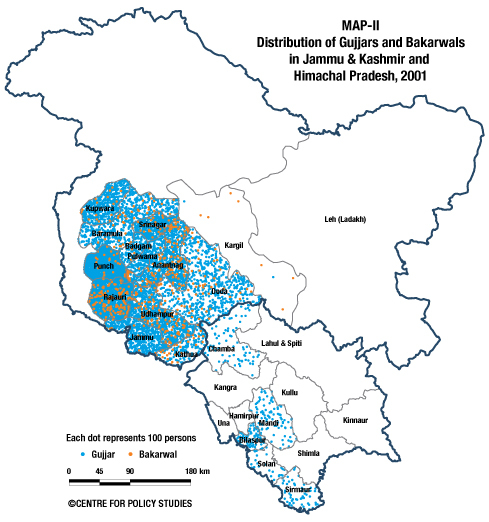 After the Gujjars, the largest tribal community of Jammu and Kashmir is that of the Bot or the Boto. They are ethnically and linguistically related to the Tibetan people. The name Bot or Boto is derived from Bod, the classical name of Tibet. The Bot, with slightly varying names, inhabit many parts of the Himalayan region. In Jammu and Kashmir, they are mostly concentrated in Ladakh. Of 96,698 Bots (or Botos) counted in the State in 2001, 77,662 were in Leh (Ladakh) and 16,499 in Kargil. Another 1,720 of the Bots were in the adjoining Doda district and 453 in Baramula. 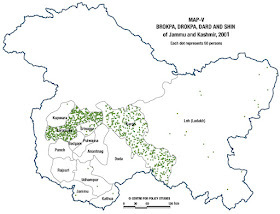 As seen in Map III below, there are also considerable numbers of the related tribe of Bhot or Bodh in the neighbouring districts of Himachal Pradesh, especially in Lahul & Spiti and Kullu. Of 91,495 Bots counted in 2011, 86,155 are Buddhist. Buddhists thus form more than 94 percent of the Bots. The remaining population of Bots is almost entirely Muslim. In 2011, there are 4,526 Muslims among them forming nearly 5 percent of the Bots. The number of Bots in Jammu and Kashmir has declined from 96.7 thousand in 2001 to 91.5 thousand in 2011. This implies a negative growth of 5.4 percent, while the Gujjars in this decade have grown by 28.4 percent and the Bakarwal by 86.4 percent. It is remarkable that though the total population of the Bots has declined, the number of Muslims among them has increased from 3.4 to 4.5 thousand in the same decade. The decline in the Buddhists among the Bots therefore has been even sharper than the decline in their total population. We see later that the growth of Bhots or Bodhs of Himachal Pradesh has also been much slower than that of the Muslim or Hindu tribes. There is another small Buddhist scheduled tribe in Ladakh, the Changpa. They are inhabitants of the vast Changtang plateau of Tibet, a small part of which extends into Ladakh. In 2001, a total of 5,038 Changpa were counted in Jammu and Kashmir; of them 4,926 were in Leh and 106 in Kargil. Their number in 2011 has declined to 2,661. The Changpa, like the Bot, are Buddhist. But, there were 113 Muslims among them in 2001; that number has more than doubled to 255 in 2011, while that of the Buddhist Changpas has declined to less than half of their number in 2001. The Balti and Purigpa are Ladakhi tribes that are ethnically and linguistically related to the Tibetan and Dardic people. They, like other tribes of Ladakh, were followers of Buddhism and were converted to Islam by Sufi Muslim missionaries in the fifteenth century. Balti and Purigpa are closely related. Purig is an older name for the Suru River Valley of Kargil and many of the Baltis of Kargil have taken the name Purigpa. As seen in Map-IV below, while Baltis inhabit both Leh and Kargil, Purigpas are almost entirely in Kargil. In 2001, of 37,700 Purigpa counted in the State, 37,642 were in Kargil. Of about 52 thousand Baltis counted in 2011, more than 50 thousand are Muslim; and of 39 thousand Purigpas, 38 thousand are Muslim. The remaining few of them are mostly Buddhists. In 2011, there are 1,386 Buddhist Baltis and 992 Buddhist Purigpas. During the last decade, Baltis have grown robustly by nearly 34 percent, while Purigpas have grown by less than 4 percent. This may be partly because in Kargil theses two names are, to some extent, interchangeable. The population of the two together has grown by 18.95 percent, which is higher than the growth of 15.96 percent recorded by the total population of Ladakh (Leh and Kargil together) during this decade. Brokpa, Drokpa, Dard and Shin is a group of tribes that speak the Dardic languages. It is said that the Dardic tribes are the bearers of the proto-Rigvedic language and culture; they seem to retain many of the symbols and rituals of that ancient past. Because of these ancient connections, which they have kept alive in the present, some of their villages in Ladakh have become centres of tourist attraction. In Jammu and Kashmir, these tribes are concentrated mainly in Kargil and Baramula districts. Of 51,957 persons of these tribes counted in 2001, 26,066 were in Baramula and 23,418 in Kargil. Another 1,002 Brokpas were in Leh and 1,199 in Srinagar. Notwithstanding the roots of these tribes in the Hindu antiquity and persistence of that memory in their language and ritual, they have been all converted to Islam perhaps a few centuries ago. Of 48.4 thousand Brokpa, etc., counted in 2011, 45.1 thousand are Muslim. Of the rest, 3,144 are Buddhist and 133 Hindu. As seen in the Table above, the population of this group of tribes has suffered a decline during the last decade. Their number has declined by about 7 percent from 52 thousand in 2001 to 48.4 thousand in 2011. Surprisingly, the number of Buddhists among them has increased in this period. The Gaddi and Sippi are pastoral tribes, who belong to several Hindu castes. In Jammu and Kashmir, they live mainly in the southern districts of Udhampur, Kathua and Doda. Of 35,765 Gaddis counted in J&K in 2001, 15,468 were in Udhampur, 11,833 in Kathua and 8,129 in Doda. Of 6,561 Sippis counted in J&K in 2001, 4,347 were in Kathua, 1,481 in Udhampur and 673 in Doda. There is an even larger presence of Gaddis in the adjoining Chamba district of Himachal Pradesh; in 2001, about 92 thousand Gaddis were counted in Chamba. Sippis are not in the list of Scheduled Tribes of Himachal Pradesh. As we have mentioned, Gaddis and Sippis are Hindu tribes, they even retain the Hindu caste structure and caste names. Therefore, it is not surprising that 94.6 percent of the Gaddis and 99.5 percent of the Sippis counted in 2011 are Hindus. The remaining nearly 5 percent of the Gaddis and 0.5 percent of the Sippis are nearly all Muslims. There has been a surprisingly sharp rise in the number and share of Muslims among the Gaddis during the last decade. The number of Hindu Gaddis in this decade has grown by 24.6 percent, which is lower than the average growth of the ST population in the State. But the number of Muslim Gaddis has grown by nearly 6 times, from 418 in 2001 to 2,457 in 2011. The share of Muslims among the Gaddis has therefore risen from 1.2 to 5.3 percent, while the share of Hindus has declined from 98.7 to 94.6 percent. This sudden rise of Muslims in the only significant Hindu tribe of Jammu & Kashmir is indeed a matter of concern. Gaddis have registered considerable growth during the last decade, though it is lower than the average growth of the ST population and of the larger Muslim tribes of the State. But the number of Sippis in the State has declined by more than 9 percent, from 6,561 in 2001 to 5,966 now. This decline may be partly because the terms Gaddi and Sippi are to some extent interchangeable; but it may also be because the non-Muslim tribes are coming under demographic pressure in the State. As we have seen, the numbers of the Buddhist Bot and Changpa tribes have also declined during this decade. Besides the eight tribes described above, the Census also lists three smaller tribes: the Mon, Garra and Beda. As shown in the Table here, the number of each of these three is less than a thousand. Mons are 55 percent Muslim and 42 percent Buddhist. Garras are about 28 percent Muslim and 59 percent Buddhist. Bedas are about 19 percent Muslim and 68 percent Buddhist. Much of the population of these three tribes is in Leh (Ladakh) district. The Census of 2011 counts 1.11 lakh persons under the category of Generic Tribes; earlier this category was referred to as Unclassified Tribes. The number of persons under this category was only 7.5 thousand in 2001. Nearly 84 percent of the large numbers counted in this category in 2011 are Muslims. This sudden rise in the population of the Generic Tribes needs to be looked into. After Jammu and Kashmir, Himachal Pradesh is the only State of northwest India with a significant presence of the Scheduled Tribes. In 2011, 3.92 lakh STs amounting to 5.71 percent of the total population have been counted in the State. As seen in the Table above, the ST population has registered robust growth of 60.32 percent during the last decade, compared to rather modest growth of 12.94 percent in the total population. This has resulted in the share of the STs rising from 4.02 percent in 2001 to 5.71 percent now. Of 3.92 lakh STs counted in 2011, 3.08 lakh are Hindus. Hindus form 78.5 percent of all STs; their share has somewhat improved from the level 76.4 percent in 2001. This has been mainly at the cost of Buddhists, whose share has declined sharply during 2001-11. As seen in the Table above, the population of Muslim STs has more than tripled during the last decade; their rate of growth has been more than 3 times that of the total ST population and also of the Hindu STs. The share of Muslims in the ST population has consequently increased from 5.04 percent in 2001 to 9.49 percent in 2011. As in Jammu & Kashmir, Buddhist STs in Himachal Pradesh have seen a considerable loss in their share of the ST population. In Jammu & Kashmir, the population of Buddhist STs has registered an absolute decline of 1.55 percent during 2000-11; in Himachal Pradesh, their population has not declined, but it has grown by a mere 1.98 percent, while the total ST population has grown by more than 60 percent. The share of Buddhists among the STs has consequently declined from 18.4 to 11.7 percent. There are 10 tribes and tribal groups in the Scheduled Tribes list of the State. In Map I in the earlier part of this note, we have shown the 2001 population of the more numerous of the tribes in each of the districts. It would be instructive to refer to that Map, while looking at the detailed demography of the different tribes discussed below. Gaddis are the largest tribe of Himachal Pradesh. In 2011, of the total ST population of 3.92 lakh, 1.78 lakh are Gaddis. They are largely concentrated in Chamba. In 2001, of the total 92,569 Gaddis counted in Himachal Pradesh, 91,789 were in Chamba district. As we have seen, there is also a considerable presence of Gaddis in Udhampur, Kathua and Doda districts of Jammu & Kashmir, which lie in the neighbourhood of Chamba. (See, Map-I and Map-VI above). Gaddis of Himachal Pradesh are almost entirely Hindu. Of 1.78 lakh Gaddis counted in 2011, only 598 are other than Hindu. Among these, 292 are Muslims and 236 are counted under the category of Religion Not Stated (RNS). Of the Gaddis of Jammu & Kashmir, nearly 5 percent are Muslim. 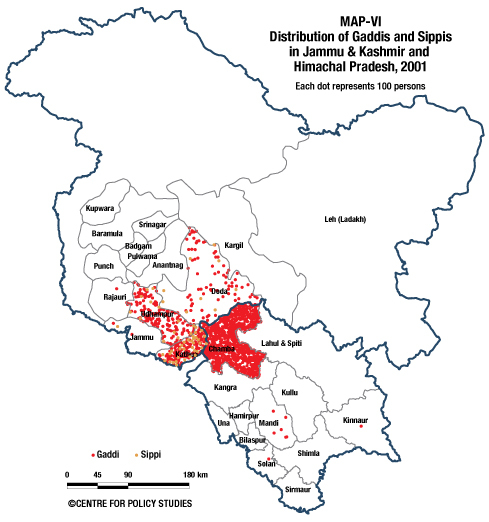 The population of Gaddis of Himachal Pradesh has nearly doubled during 2001-11. The number of Muslims among them, though small, has grown at an even more rapid rate, leading to a slight lowering of the share of Hindus among the Gaddis. In comparison, the Gaddis of Jammu & Kahsmir, who are immediate neighbours of the Gaddis of Himachal Pradesh, have grown by less than 30 percent and the closely related tribe of Sippis there has declined by 9 percent. Gujjars are concentrated mainly in Chamba, Mandi, Bilaspur, Solan and Sirmaur districts of Himachal Pradesh. During the last decade, their population has nearly tripled from 35.5 to 92.5 thousand. This has made them the second largest tribe of Himachal Pradesh after Gaddis. In 2001, Kanuara or Kinnara were the second largest; they then numbered 61.7 thousand compared to 35.5 thousand Gujjars. (See, Map-I and Map-II above). Unlike in Jammu and Kashmir, a majority of the Gujjars in Himachal Pradesh are Hindus, though almost all of the Gujjars in Chamba are Muslim. Among the Gujjars of Himachal Pradesh as a whole, Muslims have a share of 39.2 percent. There has been a distinct rise in the Muslim share during the last decade. In 2001, Muslims formed less than 34 percent of the Gujjars. Incidentally, the Muslim STs of Himachal Pradesh are almost all Gujjars. Of 37,208 Muslim STs counted in 2011, 36,230 are Gujjars. Kanaura or Kinnara are the tribal people of Kinnaur district of Himachal Pradesh. They seem to have been defined not by ethnicity, but territoriality and language. Of 61,660 Kinnaras counted in Himachal Pradesh in 2001, 55,973 were in Kinnaur district, and most of the remainder were in the neighbouring districts of Kullu and Shimla. There has been a sharp decline in the number of Kanauras or Kinnaras during the last decade. They numbered 61,660 in 2001; their number is 50,994 in 2011. About a quarter of the Kanauras are Buddhists; the remaining are mostly Hindus. As seen in the Table, both Hindu and Buddhist Kanauras have suffered a decline during the last decade, but the decline has been relatively sharper for the Buddhists. The share of Buddhists among them has consequently declined from 29.8 in 2001 to 27.3 percent now. The Bhot or Bodh of Himachal Pradesh is probably the same tribe as the Bot or Boto of Jammu & Kashmir. Almost all of the Bhots of Himachal Pradesh are in Lahul & Spiti, which adjoins Ladakh, and in the neighbouring Kullu districts. 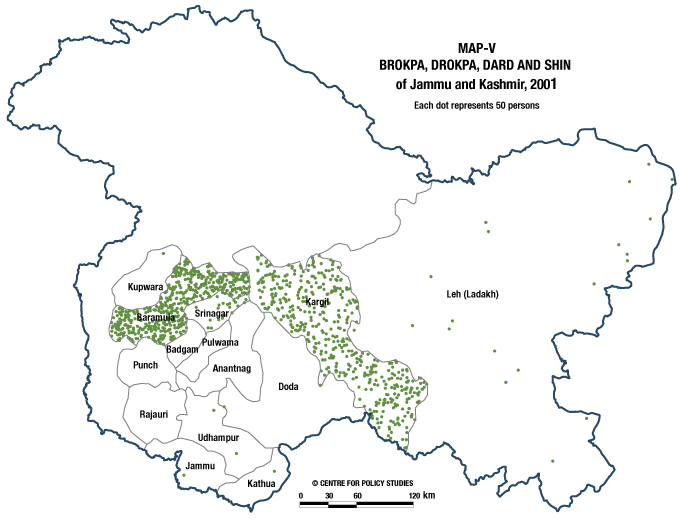 Of 25,228 Bhots (or Bodhs) counted in the State in 2001, 17,215 were in Lahul & Spiti and 5,407 in Kullu. There were another 1,358 were in Kangra. (See, Map-I and Map-III above). Of 27.2 thousand Bhots counted in 2011, 25.4 thousand are Buddhists. The remaining are mainly Hindus. During the last decade, Bhots have recorded a modest growth of 7.8 percent. Uncharacteristically, the number of Hindu Bhots has declined, while the Buddhist Bhots has grown by more than 8 percent. The share of Buddhists in the total population of Bhots has consequently increased from 92.8 percent in 2001 to 93.3 percent now. The name Pangwala comes from Pangi valley formed by river Chandrabhaga (Chenab) in Chamba of Himachal Pradesh. Of a total of 16,230 Pangwalas counted in 2001, 15,875 were in Chamba; where they formed the second largest tribal community after Gaddis. Like Gaddis, Pangwalas are mainly Hindu. Of 17.5 thousand Pangwalas counted in 2011, 16.8 thousand are Hindus. Of the rest, 737 are Buddhists. During the last decade, Pangwalas have grown by a modest 8.21 percent; and, unusually, the few Buddhists among them have recorded a higher growth than the majority Hindus. The share of Buddhist Pangwalas has therefore slightly improved during 2001-11. Swanglas are from Pattan Valley formed by Chandrabhaga river in the northern part of Lahul & Spiti district of Himachal Pradesh. Of 9,026 Swanglas counted in 2001, 6,778 were in Lahul & Spiti; another 2,106 Swanglas were in the neighbouring Kullu district. Like other tribes of this region, Swanglas are Hindus. Of 9,630 Swanglas counted in 2011, 9,290 are Hindus. The rest are mostly Buddhists. During the last decade, the population of Swanglas has recorded a rather modest growth of 6.7 percent; but the already small number of Buddhist Swanglas has further declined. The share of Buddhists among the Swanglas has consequently declined from 5.3 to 3.4 percent. The name Lahaula is derived from Lahaul Valley of Lahul & Spiti district. But of 1,733 Lahaulas counted in 2001, 1,049 were from Kullu district and another 409 from Chamba. There were only 88 Lahaulas counted in Lahul & Spiti district. Near half of the Lahaulas are Hindus and the other half are Buddhists. During the last decade, there has been a significant rise in the number of Lahaulas; they have recorded a growth of 66.5 percent, which is somewhat higher than the average growth of the STs in Himachal Pradesh during this decade. And, the growth has been almost equal for the Hindu and the Buddhist Lahaulas. This is a small group of tribes, inhabiting mainly Kullu district. Of 1,474 persons counted in this group in 2001, 1,019 were in Kullu and another 153 in the neighbouring Shimla. Jads are largely a Buddhist tribe. But during the last decade, the number of Hindu Jads has more than doubled. The proportion of Buddhist in the population of this group of tribes has therefore declined from 83.2 to 71.3 percent. Two groups of tribes, Domba, Gara and Zeba comprising one group and Beta or Beda the other, have been counted among the Scheduled Tribes of Himachal Pradesh for the first time in 2011. These two groups are probably similar to or the same as Garra and Beda tribes that have been included in the list of STs in Jammu & Kashmir since 1989. As seen in the Table, their numbers in Himachal Pradesh are even smaller than in Jammu & Kashmir. A majority of the Domba, Gara and Zeba are Buddhists, while the Beta or Beda are mostly Hindus. 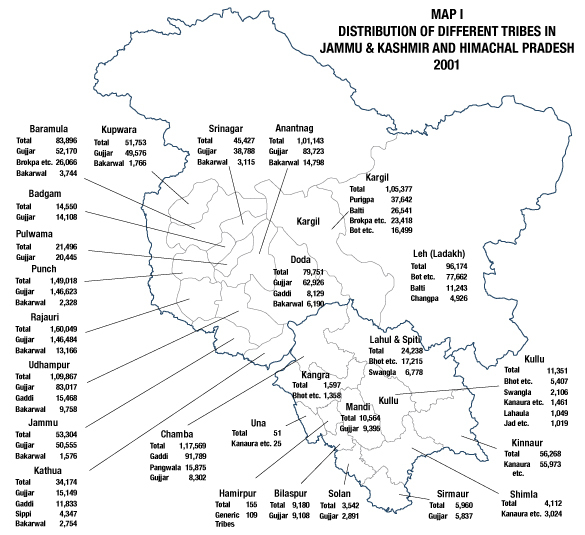 The number of persons counted under the category of Unclassified or Generic Tribes has increased considerably during the last decade, though the increase is not quite as spectacular as in Jammu & Kashmir. The total population of the Generic tribes has risen from 1.1 thousand in 2001 to 10.8 thousand in 2011. A substantial majority of the STs counted in this category are Hindus, but there is also a considerable proportion of Buddhists among them. As we have noticed above, the two largest tribes of Himachal Pradesh, the Gaddi and Gujjar, have registered a much higher growth than others during the last decade. The population of Gaddis has nearly doubled between 2001 and 2011 and that of Gujjars has multiplied by more than two and a half times. None of the other tribes, except the numerically small tribe of Lahaulas, has grown by such proportions. Consequently, the share of Gaddis in the ST population of the State has increased from 38 to 45 percent and the share of Gujjars has undergone an even higher increase, while the share of all other numerically significant tribes has sharply declined. 1. Jammu & Kashmir is the only States in northwest India with a considerable share of the Scheduled Tribes in its population. They form 11.9 percent of the total population in 2011. The share of STs in the contiguous State of Himachal Pradesh is much lower at 5.71 percent, and there are no Scheduled Tribes notified in the neighbouring States of Punjab, Haryana, Chandigarh and Delhi. 2. Of 14.9 lakh STs counted in J&K in 2011, 13.2 lakh are Muslim, 1.0 lakh are Buddhist and about 67 thousand Hindu. They form 88.4, 6.8 and 4.5 percent, respectively, of the ST population. 3. During the last decade, Muslim STs in J&K have grown by 38 percent and Hindu STs by 41 percent, but the Buddhist STs have registered a decline of about 1.6 percent. 4. The number of Buddhist STs has declined from 1,02,385 in 2001 to 1,00,803 in 2011, while the total population of STs in this period has grown from 11.06 to 14.93 lakh. 5. Gujjars are the largest tribe of Jammu & Kashmir. Of 14.93 lakh Scheduled Tribes counted in 2011, 9.81 lakh are Gujjars. In addition, there are 1.13 lakh persons of the closely related tribe of Bakarwals. 6. Gujjars and Bakarwals together account for nearly three-quarters of all STs in the State. They are present in all districts, excepting Leh (Ladakh). 7. As many as 99 percent of both the Gujjars and Bakarwals are Muslim. 8. During 2001-11, the population of Gujjars and Bakarwals has grown by 28.4 and 86.4 percent, respectively. The two together have grown by 32.7 percent. 9. The Bot or Boto are the main Buddhist tribe of Jammu & Kashmir. They have a total population of 91.5 thousand. There are only a handful of Bots outside Ladakh. In Ladakh, their presence is much higher in Leh (Ladakh) than in Kargil. 10. Unlike the Gujjar-Bakarwals, who have grown by 33 percent, the population of the Bots has declined by 5.4 percent. 11. There were 96,698 Bots in 2001, their number in 2011 is 91,495. 12. But the number of Muslim Bots has increased from 3,441 to 4,526. 13. In addition to the Bots or Botos, there is also the small Buddhist tribe of Changpas, who inhabit mainly the Changtang plateau. 14. Nearly 90 percent of the Changpas are Buddhist. 15. The number of Changpas has declined from 5,038 to 2,661, but that of Muslim Changpas has increased from 113 to 255. 16. Besides the Bots, Ladakh is inhabited by the Muslim tribes of Baltis and Purigpas. Nearly all of the Purigpas are in Kargil, while Baltis are in both Leh and Kargil. 17. Nearly 97 percent of both the Baltis and the Purigpas are Muslim. 18. Unlike the Bots, whose population has declined during the last decade, the population of the Muslim tribes of Baltis and Purigpas together has increased by 19 percent. Their number is now the same as that of the Buddhist Bots. 19. These are also mainly Muslim tribes, but they are known to retain a strong memory of their ancient Hindu roots in their language and rituals. Almost all of their population is in Kargil and Baramula districts. 20. Unlike other Muslim tribes, the population of this Dardic group of tribes has declined from about 52 to 48.4 thousand during the last decade. 21. These two are mainly Hindu tribes. Most of the Gaddis and Sippis are in Kathua and the neighbouring districts of Udhampur and Doda. Kathua and Doda adjoin Chamba of Himachal Pradesh, which accommodates a larger number of Gaddis. 22. Hindus form 94.6 percent of the Gaddis and 99.5 percent of the Sippis. In 2001, Hindus formed 98.7 percent of the Gaddis. 23. During the last decade, the number of Gaddis has grown by about 30 percent, from 35.8 thousand in 2001 to 46.5 thousand in 2011. The number of Muslims among them has, however, multiplied nearly 6 times, from 418 to 2,457. 24. The population of Sippis has declined by about 9 percent, from 6,561 to 5,966. 25. These are smaller tribes of mainly Leh (Ladakh) district. Their total number is 1,753, of whom 673 are Muslim and 931 Buddhist. 26. The numbers counted under this category have increased suddenly from 7.5 thousand in 2001 to 1.12 lakh in 2011. Nearly 84 percent of this population is Muslim. 27. The Scheduled Tribes population of Himachal Pradesh has increased from 2.45 to 3.92 lakh during the last decade. The share of STs in the total population has consequently increased from 4.0 to 5.7 percent. 28. Of the STs in Himachal Pradesh, 78.5 percent are Hindu, 11.7 percent Buddhist and 9.5 percent Muslim. 29. During the last decade, the growth of Buddhist STs has been much slower than others. Though their absolute numbers have not declined, as in Jammu and Kashmir, but they have grown by less than 2 percent. This is to be compared with the growth of 65 percent of the Hindu STs and 202 percent of the Muslim STs. 30. Number of Buddhist STs during the last decade has increased only marginally from 45.1 to 46 thousand, while that of Muslim STs has tripled from 12.3 to 37.2 thousand. 31. Gaddis are the largest tribe of Himachal Pradesh. Of 3.92 lakh STs counted in HP in 2011, 1.78 lakh are Gaddis and more than 99 percent of them are Hindus. Gaddis are largely concentrated in Chamba that adjoins Kathua and Doda of Jammu & Kashmir. 32. During the last decade, the number of Gaddis has nearly doubled, from less than 93 thousand in 2001 to 1.78 lakh in 2011. 32. The population of Gujjars in Himachal Pradesh has grown even faster than that of Gaddis, with their numbers rising from 35.3 to 92.6 thousand. 33. Gujjars are more widespread than Gaddis. There are considerable numbers of them in Chamba, Mandi, Bilaspur, Solan and Sirmaur districts. 34. More than 39 percent of the Gujjars in Himachal Pradesh are Muslim. During the last decade, the share of Muslims in the Gujjar population has increased by 5 percentage points, from 33.9 to 39.1 percent. Incidentally, nearly all of the Gujjars in Chamba, which shares borders with several districts Jammu & Kashmir, are Muslim. 35. Almost all of the Muslim STs in Himachal Pradesh are Gujjars. There are few Muslims among other tribes of the State. 36. Kanauras or Kinnaras are mainly from Kinnaur district. Of nearly 51 thousand Kanauras, more than 72 percent are Hindu and about 27 percent Buddhist. 37. During the last decade, the number of Kinnaras has declined from 61.7 to 51 thousand. In 2001, they formed the second largest tribe of the State, ahead of the Gujjars. 38. Bhots or Bodhs of Himachal Pradesh seem related to the Bots or Botos of Ladakh. 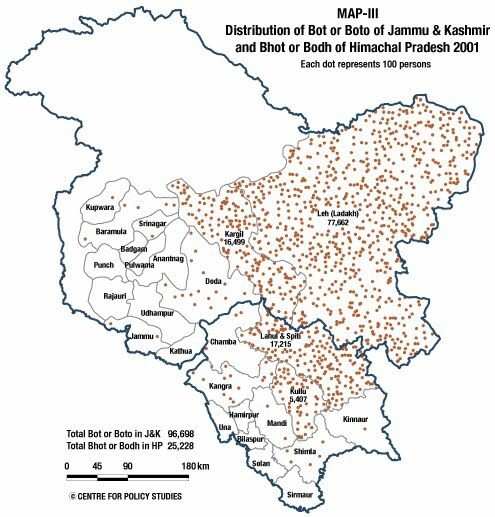 Like the Bots, the Bhots are mostly Buddhists, and most of them are in Lahul & Spiti and Kullu districts of the State. 39. During the last decade, the population of Bhots has grown by about 8 percent, from 25.2 to 27.2 thousand. This is much lower growth than that of Gaddis and Gujjars. 40. Pangwalas are a mainly Hindu tribe from the Pangi valley of Chamba. 41. During the last decade, the number of Pangwalas has grown by about 8.2 percent, from 16.2 to 17.6 thousand. Their growth is also much lower than the growth of Gaddis and Gujjars. 42. Swanglas are a mainly Hindu tribe from the Pattan valley of Lahul & Spiti. 43. During the last decade, the population of Swanglas has grown by less than 7 percent, from 9.0 to 9.6 thousand. This is much lower than the growth of Gaddis and Gujjars. 44. Lahaulas are a small tribe from the Lahaul valley of Lahul & Spiti. Nearly half of the Lahualas are Hindu and half of them are Buddhist. 45. During the last decade, they have grown by a robust 67 percent, with their numbers rising from 1,733 to 2,886. 46. This is a small group of tribes from Kullu. Nearly 70 percent of them are Buddhist and the remaining 30 percent are Hindu. During the last decade, their number has increased from 1,474 to 1,974. 47. Domba, Gara and Zeba and Beta or Beda are two groups of tribes that have been recently added to the list of STs in Himachal Pradesh. Their total population is 457 which is nearly equally divided between Buddhists and Hindus. 48. The ST population counted under this category has increased from 1,129 to 10,755 during the last decade. Of these, about 70 percent are Hindu, 24 percent Buddhist and 5 percent Muslim. 49. Thus in both Jammu & Kashmir and Himachal Pradesh, Muslims tribes have recorded high growth during the last decade. Hindu tribes have also grown in both States, though their number is rather small in Jammu & Kashmir. But, the growth of Buddhist tribes has been much lower. In Jammu & Kashmir, their absolute numbers have declined, while their share in the ST population has declined in both the States.